Releases on cassette and digitally on 11/17/17. 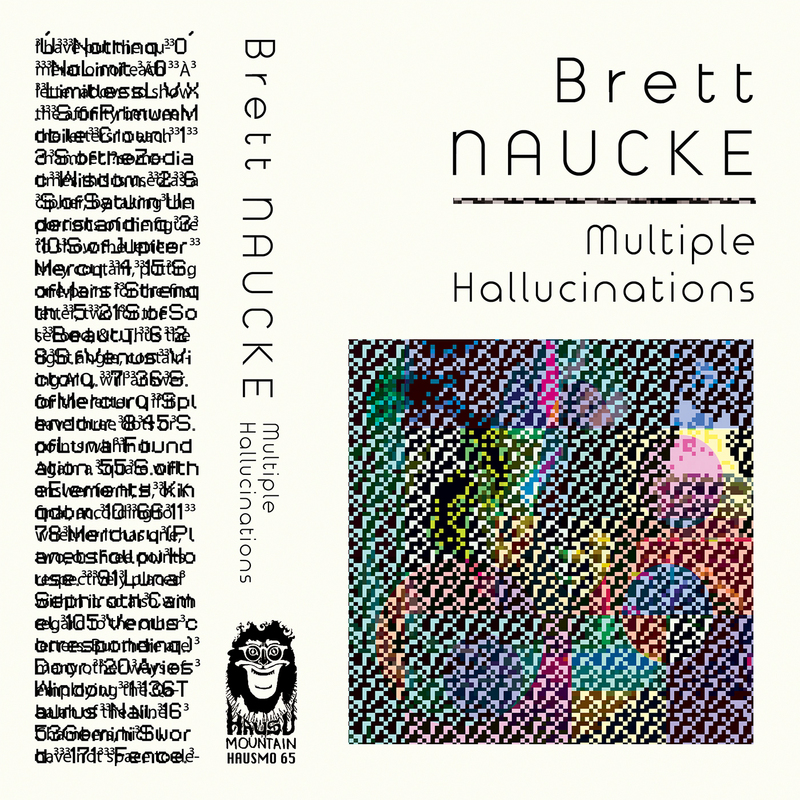 Brett Naucke‘s Multiple Hallucinations distills the Chicago-based artist’s extensive experimentation with modular synth systems into a rapid-fire program of high resolution textures and layered networks of rhythm. The album speeds through thirty contrasting sketches in thirty minutes as Naucke builds up and then jettisons his dense fields of sound one by one, sketching a tightly woven narrative strewn with unpredictable peaks of noise and valleys of ambient drift. 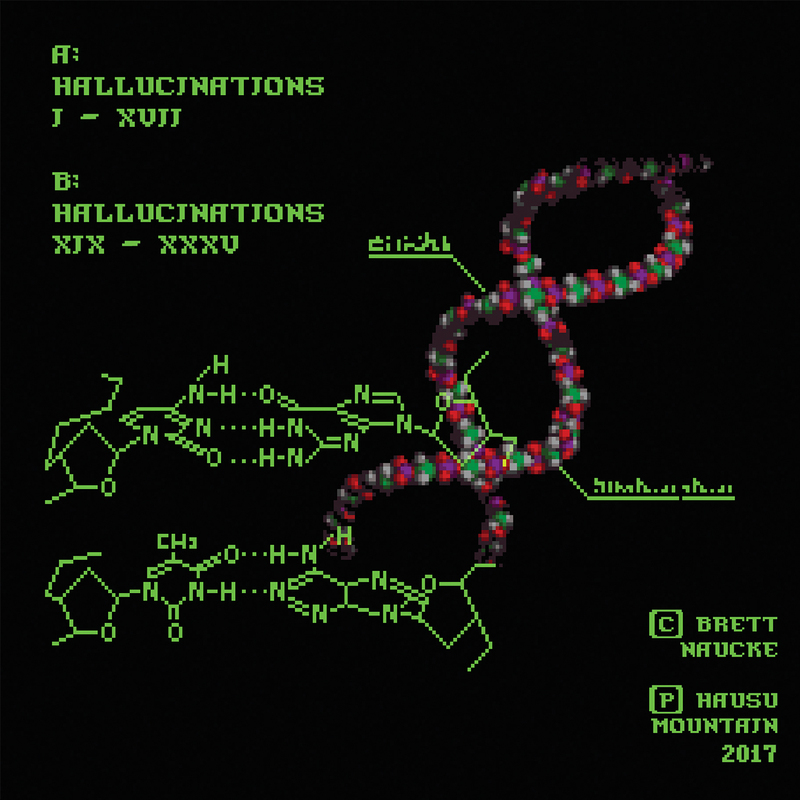 Multiple Hallucinations follows Naucke’s split with Pulse Emitter on Hausu Mountain in early 2017, adding to a catalog of LPs on Spectrum Spools and Nihilist, and tape releases on labels like Umor Rex, Nostilevo, and his own now defunct Catholic Tapes (in addition to his recent membership in seminal Chicago experimental industrial group ONO). Brett Naucke populates his electronic vignettes with a vast array of compositional strategies that illustrate in equal measure the capabilities of synthesizer performance and the level of sophistication he brings to arrangement and tonal sculpting. Fine grain washes of drone billow behind webs of percussive clicks and snaps, as onomatopoeic squelches and baroque melodic structures pop into view for fleeting moments. Multiple Hallucinations establishes discrete atmospheres and then complicates them with juxtaposed elements or sudden shifts in intensity, all within miniature frameworks that Naucke edited and stitched together in post-production after a regimen of daily tinkering and recording. The strictly enforced brevity establishes a disorienting narrative motion akin to a psychedelic trip experience, lacking in easy referents or solid ground to hold onto. But Naucke’s compositions never seem random or at odds with one another, as each beat and each blip fits into a logical whole animated by surprise and diversity.